The summer holidays are approaching and in September the next wave of our little ones will be leaving the safety of their nest to embark on their voyage of ‘education’ as our preschoolers are suddenly thrust in to the world of going to school and a new level of independence. Most children settle incredibly quickly, generally before you have even left the school grounds in a wash of heart wrenching tears and emotion, your little ones indomitable skill of effortless distraction kicks in as they throw themselves in to the fun and friendship on offer. Conversely, the abandoned parent or carer returns home amidst a sea of tears to be confronted by silence and heart wrenching reminders of a little human who has been your shadow, your sidekick and your world for the last 4 years. However, this is not only a brand new start for your little one but also for YOU. Furthermore, as the summer holiday commences before that FIRST DAY AT SCHOOL, many parents and carers are now starting to consider returning to the world of employment. It is evident from the steady flow of emails that we start to receive at this time of year, parents and carers wishing to resume employment start to question their ability after such a long break. They feel they lack confidence, that their social skills have been depleted and that they need a renewed physical and mental overhaul to boost self belief in preparation for job applications, job interviews and adjusting to the work environment. LOSS OF IDENTITY – Many feel that after a long period of being home and bringing up children that they have lost their own personal identity. The reality is you have enhanced your identity. You are not only the person you were, but you have become much more besides! As a parent you have acquired dexterity, you have become more proficient at multitasking, you have become more understanding, more aware, more patient, more compassionate and you have gained skills on how to communicate with a little one, who on occasion can be completely over dramatic and entirely unreasonable. Rest assured your new skills will give you a new dimension to tackle the workplace, and the most awkward, grumpy and unreasonable work colleagues, employers or customers you may encounter. CAN I WORK AND STILL BE AN ATTENTIVE PARENT? – Going to work can actually make you a much improved parent. As you start to interact with other adults, have distractions outside of your home, have the benefit of chatting and laughing with work colleagues and creating an independent life and role, your confidence will naturally develop. As you start to feel happier, the ripple effect will be felt at home which is great for everyone. Going to work often enhances family time, and family holidays too as you no longer take your time together for granted. On the contrary you will find you look forward to family times together and plan things to share and look forward to. I FEEL GUILTY MY HOME AND HOME LIFE WILL BE AFFECTED – There is no doubt that there will be changes ahead, however your family will always supersede work. Nonetheless, this does not mean that either have to suffer or be sacrificed. When returning to work, it is important to sit down with your family and explain that you are all a team, and as such you will need everyone to pull together. As the captain of your ship, you will now need to delegate tasks, and ensure everyone knows that if the home runs smoothly, that your free time and weekends can be orientated around fun as opposed to house hold duties. Do not forget to give praise and compliment your family members on their efforts to keep them encouraged as your unofficial home assistants. There is no doubt that you will have to implement good organisation skills, daily structure, good time management and enlist help from grandparents, family and close friends should this be necessary. However, it is vital to keep the benefits of work at the forefront so that everyone including you can appreciate the emotional, psychological, material and financial benefits of resuming work. I HAVE FORGOTTEN WHAT I USED TO KNOW – You have not forgotten what you used to know, but may need to be reminded. There can be a feeling of overwhelm when returning to work, however if this is a new job then training will invariably be provided, and if you are unsure be proud to ask for help, as no one would ever criticise you if you were to say ‘I really want to do my best, so could you please show me how to do this as well as you’. 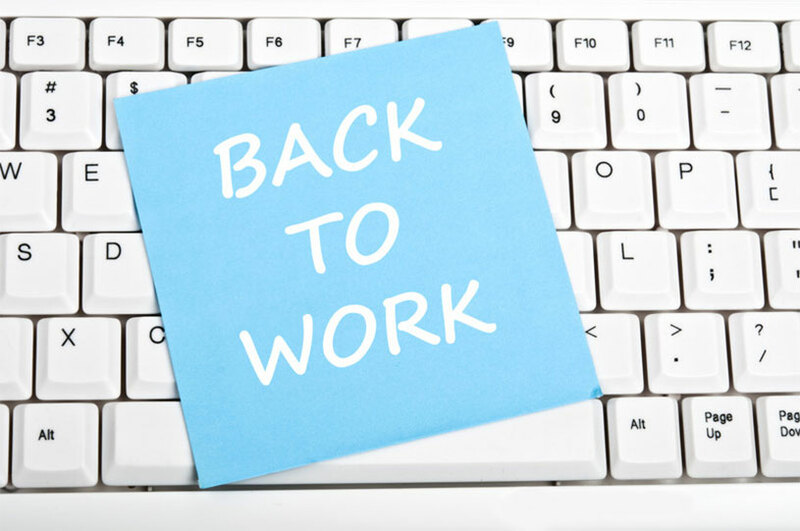 However, if you are returning to former employment, then it is a good idea to make contact with your work colleagues or even pop in to see everyone before you start. You could even take some biscuits and offer to put the kettle on to start re-establishing your work bonds. Some employers will allow you to start on a part time basis for a short period to refresh yourself on systems and to address any new procedures and protocol, and there are lots of ways to brush up on your knowledge and skills, and this can be as easy as reading your works’ website, speaking to colleagues and customers, looking in to online learning and information or asking your employer if you can shadow another colleague before you start all of which will build your confidence. I’VE LOST MY CONFIDENCE – Losing confidence is as a result of you having forgotten how well you coped before you became a parent, and not realising the additional life skills you have acquired as a parent which will now add value to you as an employee. Confidence is contextual, and as your knowledge and familiarity improve, so will your confidence. Everyone is nervous on their first day at work, or their first day back at work but you can have the confidence in yourself that you will do your very best. Do not lose sight of the fact that your employer chose YOU. You were no doubt interviewed by experienced people and they felt YOU were best for the job. Going back to work is like getting back on a bike after years of not having cycled. You may feel uncomfortable, and perhaps be a little wobbly but within a few minutes you regain your balance and take control of the bike. A new job is no different. It is also a great idea to write a list of all the things you can do, all your achievements, and all the things you are confident at. This will reinforce a positive outlook; give you more confidence and a strength to succeed. NEW START, NEW YOU – A great way to boost your confidence is to have a mini makeover. It doesn’t have to be extreme, but a new hairstyle or a new outfit can help you feel like a new person and give you that boost you need to embrace this new start. BE REALISTIC – You will miss your little one and you may not immediately pick everything up at work, but you will grow with confidence each day. This is perfectly normal and exactly what would be expected from a new or returning employee. Don’t be afraid to ask for feedback to help you to feel you are doing the best you can. Ask your employer or immediate supervisor what you could do better, and do not be shy to ask for guidance and direction. Ask for help as by doing so you are giving the person you approach a huge compliment that you value and respect their knowledge. Aim to be positive, not perfect. REWARD YOURSELF – The return to work can feel very daunting so allow yourself a little treat with your first wage packet, and also look at planning fun things with your family so they too can see the benefit of you going back to work. SEE YOURSELF FOR THE STRONG, EFFICIENT AND AMAZING PERSON YOU ARE – If you still feel you need a little boost ask your friends and family what positive qualities they see in you. Another great exercise is to close your eyes and imagine your child or partner, or someone who loves you unconditionally stood in front of you. Imagine that you are floating out of your body and in to there’s and then seeing yourself through their eyes. Feel the love they feel for you, see the strength, respect, love and admiration they have for you and know that these are all qualities that you have earned and therefore you can wear these labels with confidence and pride. We wish you a very enjoyable and exciting new life chapter ahead.